The plan is subject to an appeal. 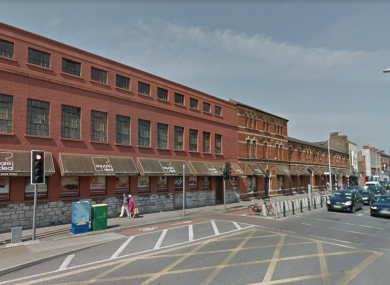 A PLAN TO build a student accommodation centre in Cork city centre has attracted objections over its height and the alteration of the original structure. Summix WSC Developments is hoping to build a 228-bed, six-storey building in the city on the former premises of Square Deal, a furniture superstore. The plan would include the retention of the 19th century two- and three-storey redbrick sections on Washington Street West. The furniture shop, which closed in 2015, is a protected structure. Cork City Council has already given the green light to the development, which includes a co-working space, a cafe bar and meeting rooms. However, there have been four submissions made on the plan, leading it to end up before An Bord Pleanala. The objections come from two local property owners, a Cork resident and an architectural heritage consultant. Frank Sheahan, who has interests in two neighbouring buildings, wrote that he was worried that the height of the new building would impact those living on the upper floors of the Lancaster Hall student accommodation. Another objection comes from 3S Integrity Investments, which owns and had planning permission for a similar site next door to the Square Deal site. It had proposed an ambitious apartment complex on the site. The 3S submission says that the company wants the new plan to be “carefully considered” in the context of its own proposal. It adds that set down areas for deliveries and taxis could also cause complications on the busy Washington Street. An observation by a man living nearby says that the city’s housing stock was showing “a bias” towards student accommodation. The strongest observation comes from architectural heritage consultant Livia Hurley. She says that the plan would interfere with the city’s fabric. “Unlike much of Dublin’s historic fabric (17th-20th century) which has been excessively removed and misused through redevelopment over the last 50 years, Cork city has largely been spared. Hurley points out that the westerly section of what was the Lee Boot Factory was built in 1919 and she says it is “an important modernist work” from a period “largely ignored”. The building was designed by Chillingworth and Levie, who also designed the Counting House at Beamish & Crawford, the Winthrop Arcade, the former Roches Stores and Savoy Cinema sites and the Eagle Printing Press. Hurley says that the proposed development is “admirable” and the use of materials is “well thought out”, but the integration of the original structure “is not reflective of good conservation practice”. Hurley implores the planners to “learn from the lessons of Dublin”. The site is one of many student accommodation projects planned for Cork, including a 413-bed site on the old Beamish brewery. Email “Student accommodation plan for Cork 'overlooks the city's architectural, cultural and social history'”. Feedback on “Student accommodation plan for Cork 'overlooks the city's architectural, cultural and social history'”.